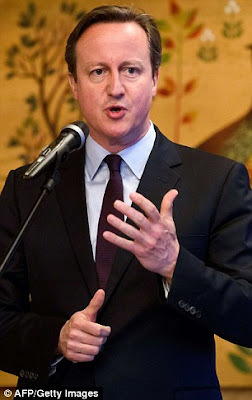 Too many British Muslims ‘quietly condone’ extremism, David Cameron will say today. In a blunt speech, he will urge families to speak out against the ‘poisonous ideology’ driving hundreds of young people to wage jihad for Islamic State. The Prime Minister will also call for parents to stop blaming police and the security services for failing to prevent British teenagers heading to Syria. Parts of the Muslim community are guilty of normalising hatred of democracy and western values, he warns – making it easier for violent extremism to take hold. At the weekend, 17-year-old Talha Asmal became Britain’s youngest suicide bomber when he detonated a car loaded with explosives in the northern Iraqi town of Baiji. But he will point out it is easier to go from being a troubled teenager to a jihadist if extremism ‘is quietly condoned online or perhaps even in parts of your local community’. Islamic State and its medieval outlook are ‘one of the biggest threats our world has faced’, the Prime Minister will add. The speech, made the day after the start of the holy festival of Ramadan, is likely to spark anger in parts of the Muslim community. But Downing Street said Mr Cameron believed parents must speak out. A source said people should ‘look at the radicalisation of people here in the UK and what is going on in the areas where they live, their households and their communities’.